These Stuffed Cheesy Pesto Rolls are an easy dish to make for those hungry dinner guests. Soft and buttery rolls are filled with pesto sauce and mozzarella cheese, and then baked until golden. Crispy on the outsize and oozing with flavor on the inside, this simple roll is sure to wow even the pickiest of eaters! It’s time to talk about some carbs today, friends! After all, carbs are never a bad thing, right? I’m a sucker for warm, soft, garlic-y, herb-y bread. You know, the Olive Garden type bread sticks, rolls straight from the oven, that sort of thing. There’s just nothing better in my book! And when my cravings hit, you better believe that I’m allll about the bread. Or rolls, in this case. And pesto. Let’s not forget about the pesto! 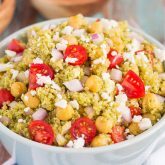 From this Easy Basil Pesto, to that Basil Pesto Pasta with Broccoli and Mushrooms, this Pesto Tortellini Bake, and that Quinoa and Chickpea Pesto Salad, I love it all. I have a soft spot for pesto and try to incorporate it into as many dishes as I can. 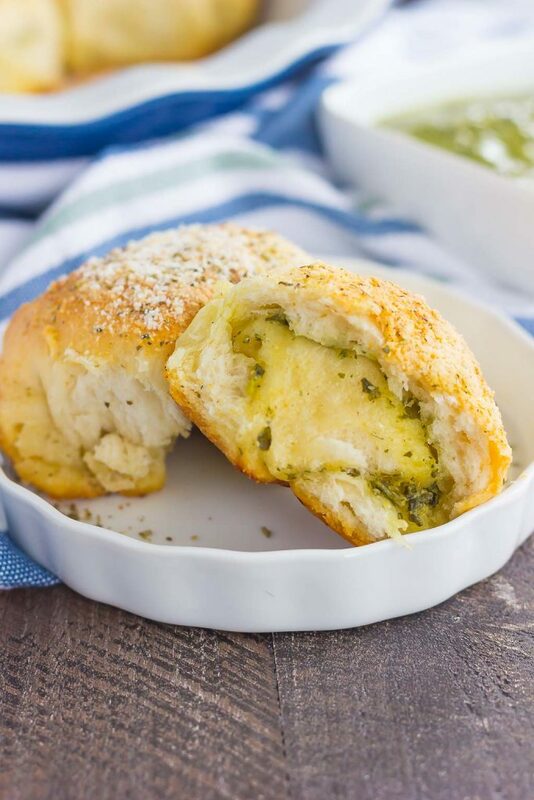 If you love pesto and cheese, then you’ve got to try these easy and oh-so cheesy rolls. They’re bursting with deliciousness and so easy to make. 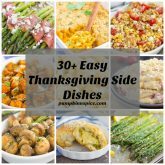 Because remember, I’m all about the easy recipes here on Pumpkin ‘N Spice! Now, I know pesto rolls aren’t necessarily anything new, but I just had to try them. And I got the inspiration from these Stuffed Pizza Rolls that I made a few years ago. While the pictures definitely need an update (see how far I’ve come in blogging photography?! ), the recipe still remains just as delicious. I used a pre-made biscuit dough, some store-bought pesto (although you could easily make my Basil Pesto Sauce for these babies), and some mozzarella pearls and spices. Easy peasy and oh-so good! In about 20 minutes, these rolls will be piping hot and ready to be devoured. And the best part? 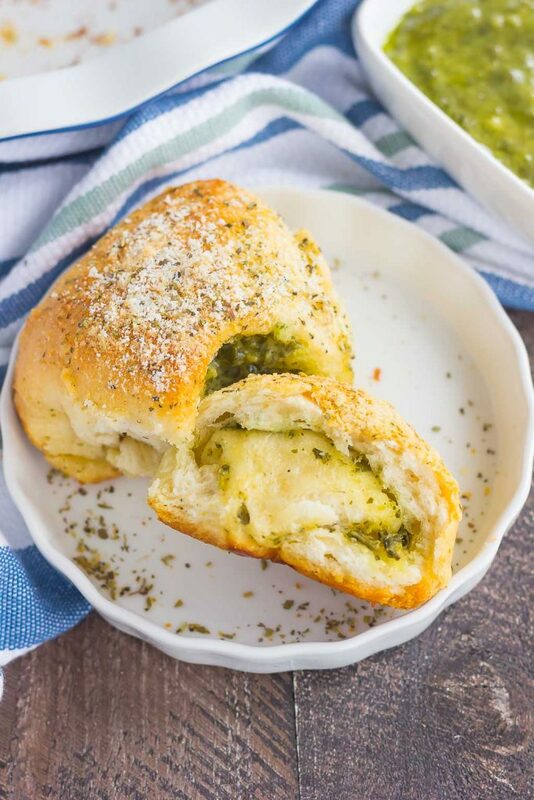 These Stuffed Cheesy Pesto Rolls make a delicious appetizer, side dish, or late night snack. Pesto and cheese were made for each other, especially when combined in a flaky and buttery biscuit. Mmm mmm good! Preheat oven to 375F. Lightly grease a casserole dish or 9 inch pie pan with cooking spray. Set aside. Flatten each biscuit with the palm of your hand (or rolling pin). Spread about 1 teaspoon of pesto sauce onto the center of each biscuit, followed by one mozzarella pearl. Working one at a time, pinch the sides of the roll upwards to seal the dough, and then roll into a ball. Place into prepared dish. Repeat with each remaining biscuit. Lightly brush the butter mixture on top of each roll. Sprinkle Parmesan cheese over the tops. Bake for 18-20 minutes, or until the rolls start to brown and the tops are firm. Refrigerated biscuit dough is like magic! :) So versatile, and so good! You've basically combined all of my kids' favorite ingredients into one garlicky and cheesy carb-tastic comfort food. These look awesome, Gayle! It sure it like magic! Thanks for the sweet comment, friend! These pesto rolls look delicious, Gayle! 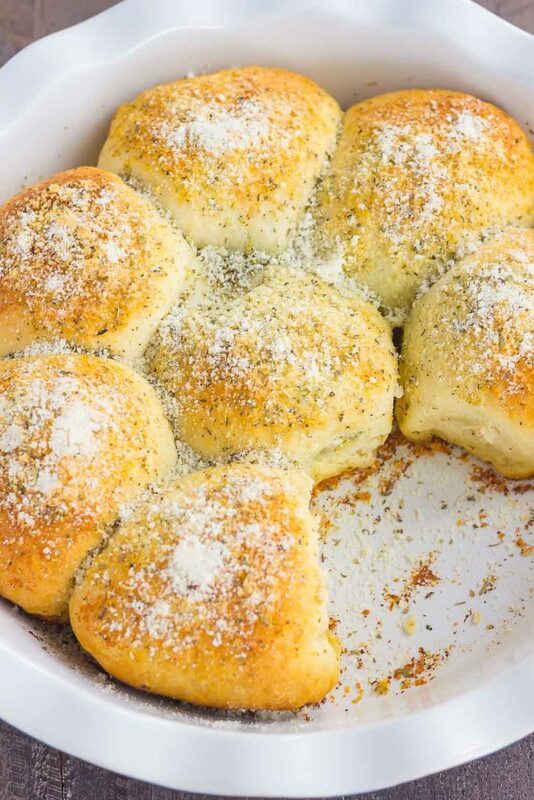 Nothing is better than cheesy, buttery rolls... especially when there is pesto involved! I totally agree! Thanks, Keri! Haha right?! It's the best for a Monday! :) Thanks, Ashley! Ohhh man! The only thing better than a piece of cheesy bread is a piece of cheesy bread with pesto inside!! This sounds and looks heavenly! Yesss! Cheesy pesto bread definitely kicks it up a few levels! :) Thanks, Sues! Oh my goodness, pesto is literally my FAVORITE thing to eat with bread so these gorgeous rolls are right up my alley! Who could resist all that cheesy mozzarella goodness?? Thank you, Sarah! 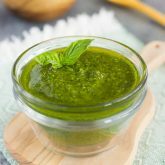 Pesto is the BEST on bread! Any day that involves carbs is a good day if you ask me and you really can't beat that store bought dough - so convenient! And you know what? I just happen to have the ingredients to make these babies! Woot woot! It's a holiday here and raining and this would be perfect to have! Honestly, if it were sunny, they still would be perfect cause cheese and carbs ;) Pinned! Cheers to an awesome week, my friend! Carbs are definitely a good thing, especially with cheese! Thanks for the sweet comment and pin, Dawn! Yes! Stuffed anything is a winner in my book! Thanks for the pin and kind words, friend! Gayle these look SO delicious with that pesto and cheese oozing out of them! What a great idea to use biscuit dough to make these super easy. I'm a sucker for fresh baked bread, pesto, and cheese so these are a triple threat where I'm concerned! I love finding simple ways to make things, and pre-made biscuits are the best! :) Thanks, Marcie! 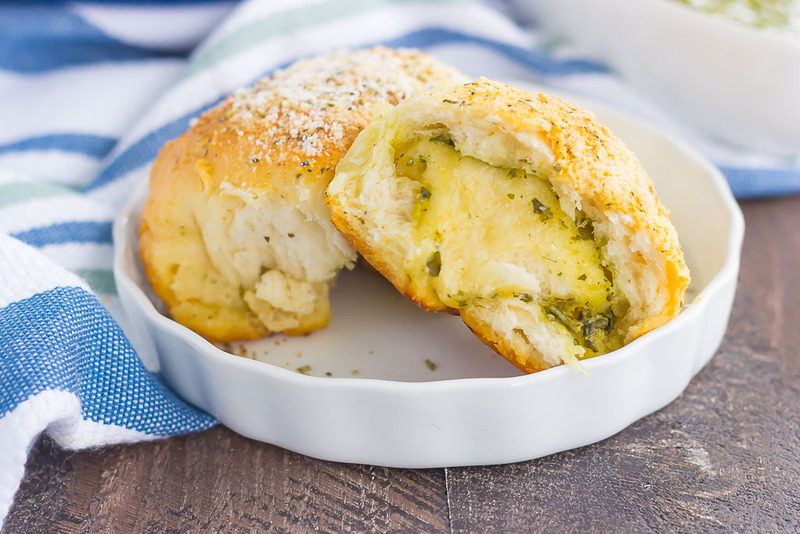 Stuffed rolls with pesto are sooo good! Thanks, Cathleen! Oh my goodness, soft cheesy bread is like the best thing! 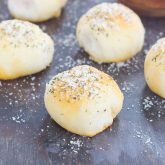 Love that you added pesto - these gorgeous rolls would disappear SO quickly at our house! Cheesy pesto rolls, Heaven Balls-- either name works, really. I mean come on, does it really get any better than this!? Didn't think so. These rolls look so tasty! Does it get any better than this? I don't think so! 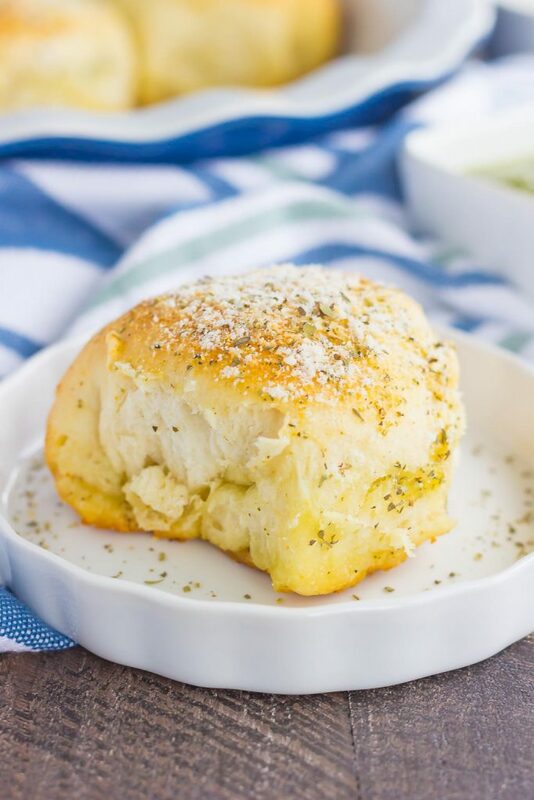 Soft buttery rolls with pesto and gooey cheese is all I'm going to crave until I have it! Thanks for sharing!! Pinned! Thanks for the pesto love and pin, friend! Cheesy carbs are definitely needed most day! :) Thanks, Lindsay! These look delicious! anything with pesto is always amazing in my opinion! OMG these sound dangerously crave-worthy!! The pictures are so enticing and I love everything about the flavor. Carb heaven! I want all the stuffed cheesy pesto rolls!!!! yum and love the video! I have been on a pesto kick like no other lately ... and stuffed inside these rolls??? Yes yes! I wish I had one (or three!) to go with my lunch! They're SO good! Thanks, Ashley! Thank for the pesto love and pin, friend! I'm so glad you like this, Sherry! I love the idea of using frozen bread dough...let me know how it turns out! Thanks so much for stopping by!